Here is a tiny island that floats on the Southern Pacific Ocean. 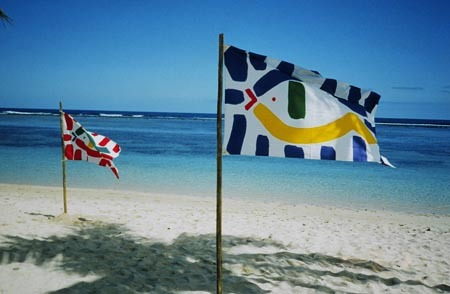 A flag on the beach starts to wave as if it is alive to praise life on Earth. Only the sun, trade winds, and the sound of waves softly washing the beach exist. As air moves, it becomes a wind, which makes the flag flutter. Feel the life in something that a person has made.